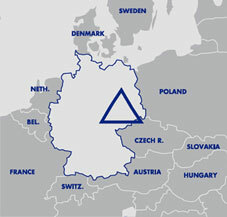 The Central German chemistry triangle is to be found in the very middle of Germany. It consists of six chemistry production sites which put forward with a very distinctive profile. The modern, environmentally compatible, highly efficient plants make them to one of the globally most competitive sites. In 2001 the Chemistry Park was privatised and taken over by the Preiss-Daimler group. By an extensive investment program it succeeded to develop this region to a profitable production site. Here in the very heart of Central Germanys chemistry triangle, the Network 4chiral is rooted. It was founded in 2006 by seven regional established middle sized enterprises with the main objective to collaborate within the field of chiral compounds as well as to show presence on a highly volatile market.